The candidates for Ellsworth City Council in the Nov. 6, 2018 election. Pictured from left to right are David Burks, Heather Grindle, Gene Lyons, and John Phillips. Images provided by the candidates. 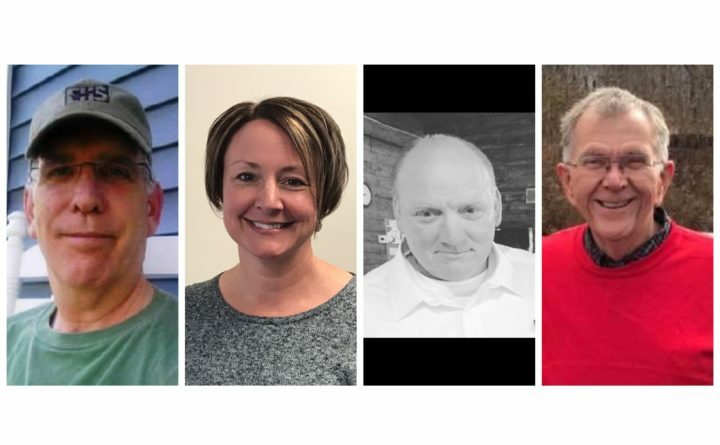 Four people are running to fill two seats on the Ellsworth City Council that are being vacated by incumbents who have decided not to seek re-election. In the running for the two available seats are David Burks, Heather Grindle, Gene Lyons and John Phillips. Stepping down from the council are Stephen Beathem and Bob Crosthwaite, each of whom has served on the council for many years. Neither Burks nor Grindle has run for public office before, while Lyons previously campaigned for a council seat in 2017. Phillips previously served on the council for several years but lost his 2017 re-election bid to current Councilor Dale Hamilton. Burks, Grindle, Lyons and Phillips each spent at least part of their formative years in Ellsworth and have lived in the city for much or all of their lives. Burks, 62, is a 25-year Navy veteran and retired elementary school teacher who also has worked at the local Home Depot. Grindle, 44, works as an accountant in the local office of a New England accounting firm. Lyons, 52, has worked for more than 30 years in the concrete industry, both as a business owner and plant manager. Phillips, 65, owned and operated Branch Pond Marine and then worked at Colwell Diesel for nearly 20 years before retiring last winter. In response to a list of questions the Bangor Daily News emailed to the council candidates, all four said they generally support the idea of a ban on single-use plastic shopping bags in the city. Each also mentioned the expansion of The Jackson Laboratory to Ellsworth as a significant driver in the city’s growing housing market and business sectors, even though the lab itself does not directly contribute to the city’s property tax base. Burks and Lyons each noted that, despite development in Ellsworth, some vacant retail spaces remain along Main Street and at Maine Coast Mall. Their answers differed when asked about what role the city should play in local ambulance service. The topic has become an issue since the city’s fire department has started responding to more medical assistance calls and County Ambulance abruptly shut down at the end of August. Burks, Lyons and Phillips each said that the availability of emergency medical services in Ellsworth is one — if not the most — pressing issue facing the city. Grindle said managing and supporting growth “without taxing our residents and our resources” is Ellsworth’s biggest challenge. Lyons said he’s also concerned about whether the city might decide to build a new public safety building, even though “taxes are already high,” and about the ongoing controversy over the possible demolition of the old Ticonic 4 firehouse in Ellsworth Falls. Burks, Grindle and Phillips each said that improving the city’s walkability and/or access to its lakes and riverfront could help improve the city’s quality of life. Burks and Phillips each said that pedestrian access around Ellsworth’s urban area has gotten better in the past decade with road and sidewalk improvement projects, and that the development of Knowlton Park on State Street also has benefitted residents. Polls will be open from 8 a.m.to 8 p.m. Tuesday, Nov. 6. Ellsworth has four voting wards. Residents of wards one and four vote at City Hall. Voters in Ward Two cast their ballots at Community of Christ Church at 283 State St., while those from Ward Three vote at Maine Coast Baptist Church at 867 Bangor Road (also known as Route 1A).